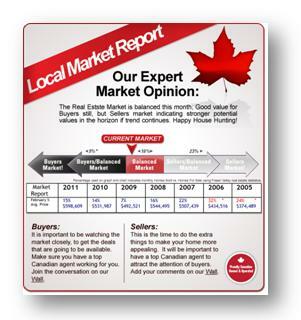 Monthly Market Trends Analysis – NOW ON YOUR CANADIAN 1st EXCLUSIVE REALTOR FACEBOOK FAN PAGE. Free of charge from Canadian 1st Realty. We set up for you, you handle all the sales leads! Let us help with our Exclusive Marketing Rights to a major Facebook Marketing Company. Lower Cost and Better Support, read more…. Canadian 1st Realty Expert Branding Program. In an effort to help our Realtors and their clients, we at Canadian 1st Realty provide an expert monthly market report available on Facebook or by email for their use. Allow us to provide you content for your Facebook page for FREE! A Professional Fan Page on Facebook simply allows you to attract Buyers and Sellers while keeping friends and family informed in a professional setting. Simple and easy. By email, clients whom don’t use Social Media can also easily access the same information. This report with help Canadian 1st Realtors remind the public monthly of our commitment to excellence. Your marketing gives you a distinct advantage when it comes to customer loyalty, let us help. Example: Canadian 1st Realty’s Market Report – March 2011. **This Months Report indicates a very balanced market. Fair Prices to be had for Buyers and Sellers realizing quicker sales times than anticipated last fall. All signs point to an increase in overall market prices from this point forward, so if you are trying to time a Revenue Property Purchase or simply getting into the market for the first time, this is a great time to buy. 15% of the Available Markets Listings Sold in February, up from the Market Lows of 7% in 2009 February but a far cry from our over heated market in 2006 when prices were spiking and sales topped 32% of Available Market Listings, Whew!– This balance in the real estate market place is a nice place to be for buyers and seller. Happy House Hunting. Canadian 1st Realty’s Market Report – March 2011. Customer loyalty is an issue for Realtors and in fact all business owners in the consumer savvy internet age we now operate in. Sometimes the client unwittingly uses another agent after spending time with you or sometimes potential clients are simply looking to us for free information. All of this is part of the job, but with the right tools and information we can secure customer loyalty for life as a Branded Expert. Our monthly reports keep them coming back for more and make you a Canadian 1st Branded Expert. Increase your closing percentages by passively involving yourself into your clients purchase experience 12 months ahead of time with these non-threatning, informational reports and see your closings increase. Customers love expert opinions and with this tool we brand you an expert! Identifying the perfect time to Buy or the perfect time to Sell is not easy to do but with these stats we can accurately give an office wide opinion to help clients feel confident.